Collagen is the essential structural component of all connective tissues, the fibrous protein constituent of skin, cartilage, bone, tooth, muscle and other connective tissue. Gelatin is collagen that has been broken down to make it far more easy to absorb. The highest quality fish gelatin has a very low molecular weight, meaning it is incredibly easy to absorb and digest and does not come out of solution even in the acid of the stomach, and will completely dissolve even in cold water. 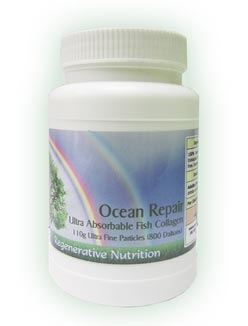 Ocean Repair by Regenerative Nutrition is extracted, by a biological enzyme process, from the fresh skin and scales of Tilapia and Codfish. Rich in 19 kinds of amino acids, it is virtually tasteless and can be added to any food or drink. Replenishing lost collagen is essential for creating permanently young looking skin and maintaining a healthy body. When you replenish lost collagen you activate your body's metabolism, allowing it to maintain its youthfulness. So collagen can help make skin lustrous and agile, even into old age. Collagen is the essential structural component of all connective tissues, the fibrous protein constituent of skin (75%), cartilage, bone, tooth, muscle and other connective tissue. Collagen acts as a scaffold for our bodies, controlling cell shape and differentiation. More than a third of the body's protein is made of collagen. Gelatin is collagen that has been broken down to make it far more easy to absorb. It is unlikely that actual collagen in its original state, as contained in beauty cosmetics, is able to be incorporated into the collagen of the skin. Fish gelatin taken orally is by far the more effective route. Gelatin, with its glycine and proline, apparently, does everything from reducing susceptibility to stress, to fighting tumors, to soothing the intestinal tract, to improving thyroid function and much more, as outlined in the article below. Gelatin also stimulates natural sleep. Gelatin commonly available in the shops is almost invariably extracted from the left overs of pigs and cows and includes the hoofs, skin, bones, tendons (including all the hormones and GMO foods that have been given to these farm animals). Furthermore the extraction process involves either a strong alkali or acid. Those with experience of taking this kind of gelatin a few times in the evenings got the benefits of a sound sleep, but on waking felt there was "horrible toxins in my body, a kind of disgusting feeling". On the other hand the best gelatin, also known as fish collagen, is made from the fins and skins of wild sea fish and extracted with an enzymatic process and comes with a certificate of analysis for all heavy metals, and has been tested also for radiation. No detectable radiation is present and all the heavy metals are extremely low, probably because they concentrate more in the flesh and inner organs of fish. The highest quality fish gelatin has a very low molecular weight, meaning it is incredibly easy to absorb and digest and does not come out of solution even in the acid of the stomach, and will completely dissolve even in cold water. The fish collagen (polypeptide) in Ocean Repair by Regenerative Nutrition is mainly extracted from the fresh skin and scales of Tilapia and Codfish . Extracted by a biological enzyme process. The resultant extract is mainly type I collagen, rich in 19 kinds of amino acids with very a low molecular weight of 800 Dalton Units. It is virtually tasteless and can be added to any food or drink. Why should one consume Hydrolyzed collagen on a regular basis for good health ? Taking fish gelatin (A highly absorbable form of collagen) should be regarded as essential for a balanced healing diet, a Core Regime Essential. Whilst for many the health benefits of gelatin are a new discovery, it is a traditional food used by hunter gatherers and all sensible omnivores around the world. Gelatin is especially important to those who do not eat meat (including gelatin rich meat broths that include bones and skin). Provides a type of protein profile that is needed to compliment and balance the diet that is not obtainable from meat, fish, eggs cheese, milk (except from the skins, fins and bones that we do not normally eat). This must be considered a master remedy to help overcome difficult to treat chronic disease that have as their basis leaky gut syndrome; where many foods are absorbed through the gut prematurely, creating allergy and constant immune distress. Taking gelatin with food can, with time, reduce the tendency to allergic response and regular consumption of gelatin heals the gut. Bowel disorders such as Crohn's, Ulcerative Colitis and Gluten Sensitivity (Celiac Disease) can be greatly reduced or eliminated by regular consumption of gelatin. All autoimmune disorders can potentially be helped due to gelatin's anti-allergy effect, general healing and immune system help. With rheumatoid arthritis and osteoarthritis gelatin should be regarded as a lead remedy as it is possibly the best nutrient profile to renew the cartilage and bones of sufferers and in conjunction with Arthro-Care and/or Repair Tonic makes a winning team in cartilage, joint and bone restoration and repair. Aging diminishes the amount of these tissues and proteins in the skin. This causes the collagen to become increasingly fibrous and inelastic; the skin becomes thin and fragile, collapses, and develops wrinkles. As collagen hardens and elastic tissues diminish, the skin loosens and lines and wrinkles form. With less elasticity, collagen fibers thicken and stiffen, causing even more wrinkling and the appearance of aging. This also happens internally to the blood vessels organs and all tissues. Bones are weakened and become porous. Collagen may also help promote the extremely important HGH (human growth hormone). This is an anti-aging hormone and supports tissue repair and lean muscle. It can be purchased but is extremely expensive. The alternative is to take nutrient complexes that promote its production. Collagen is one of these nutrient complexes. The profound sleep one gets when consuming two teaspoons of collagen in the evening is an indication of improved healing and repair generally. HGH will quite literally make your body function as if it were younger - burning fat, building muscle, thicker, more resilient skin, stronger immune system, more energy,and other benefits. Back in 1935, Reuben Ottenberg, MD wrote in the Journal of the American Medical Association: "It has been suggested that the administration of extra amounts of proteins containing an abundance of glycine (such as gelatin) will help the work in the liver. This seems particularly plausible since the recent work of Quick, who has shown that the ability of the liver to perform this protective synthesis is limited by the amount of glycine available." Ottenberg concluded with the recommendation that patients with jaundice and other liver problems take 5 to l0 grams of gelatin per day either in the form of food or as a powdered medicinal supplement. Connective tissue is regenerated very slowly, so this is a remedy that requires some patience. However amazing results have been reported; healing of joints that had been completely stiff and frozen and the gradual disappearance of arthritis. Best of all is the improvement in skin quality, with wrinkles smoothing out and even disappearing completely (For arthritis we thoroughly recommend a boron supplement to compliment gelatin, either Arthro Care and/or Repair Tonic. Details of the typical time for marked improvement of the arthritis are included in the literature for Arthro-Care). Hydrolyzed Fish Collagen (Gelatin) contains much larger amounts of the amino acids glycine and proline than many other proteins. These amino acids are necessary for promoting healthy tissue growth of hair, skin and nails. Recent studies in Europe and Japan have indicated the benefit of consuming 10 grams of hydrolyzed collagen to improve skin hydration and reduce the number of micro and deep wrinkles compared to a placebo*. It has been claimed that hydrolyzed collagen (Gelatin) may promote lean muscle mass through and the burning of fat rather than carbohydrates and proteins, lessening the symptoms of arthritis, toning and thickening skin, joint rebuilding, arterial strengthening, increased energy, organ rebuilding, alleviating osteoporosis, high blood pressure, bladder weakness, chronic fatigue, shallow breathing, autoimmune, skin problems, and splitting nails.